Are you feeling tense? Do you suffer from frequent headaches or chronic back pain? You might be surprised what a one-hour massage can do for you. At Wasserman Chiropractic, our staff includes experienced massage therapists who can help you relax through the healing art of massage. Relives back pain and improves range of motion. Great for expectant mothers by relieving tension and shortening labor. Helps build a stronger immune system by stimulating lymph flow. Helps build weak, tight, or atrophied muscles. Great for athletes before and after workouts. Improves condition of the skin. Beneficial for conditions like high blood pressure and arthritis. If you’re like many people, you might have some reservations about massage therapy. At Wasserman Chiropractic, we do all we can to ensure your comfort and to ease any concerns you might have. What happens during a one-hour massage? The massage will take place in a warm, comfortable room. You will be clothed to the extent that you are comfortable, with drapes provided. As you lie on a table that is designed for comfort and relaxation, the massage therapist will work on an area at a time, keeping other areas covered. A one-hour massage is a full-body massage including your neck, shoulders, back, legs, and feet. Trigger point therapy – targets selected areas of tension and alleviates tension through tight circles of pressure and release. Swedish massage – light to medium pressure designed to relieve stress and tension. 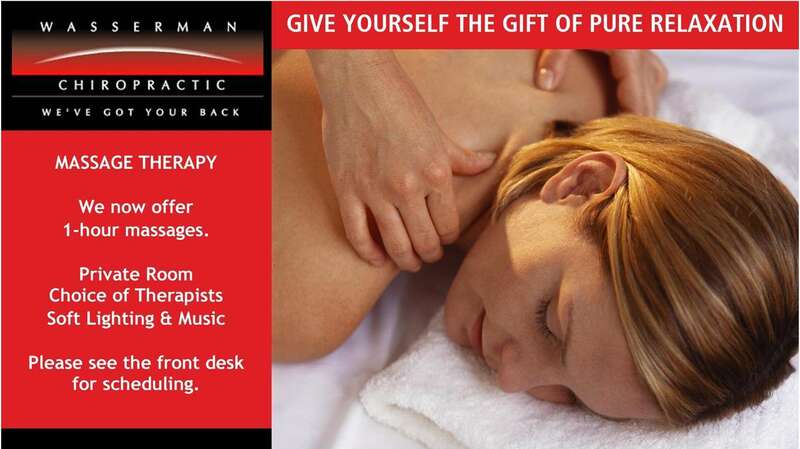 Deep tissue massage – focuses on deep level tissue to relieve knots and chronic muscle tension. Sports massage – great for athletes. Focuses on trouble areas. Cranial sacral therapy – focuses on relieving headaches, back pain and TMJD. Prenatal massage – differs depending on the mother’s needs for relaxation. Geriatric massage – improves overall health of elderly patients. What can one hour of your time do for you? For excellent massage therapy in Coral Springs, you can trust the professionals at Wasserman Chiropractic. For over 30 years we have helped people who suffer from chronic pain find relief and healing. Our friendly staff are here to develop a plan of treatment that works for you, while always striving to keep you comfortable. Schedule your one-hour massage today! To learn more about one-hour massage therapy or to schedule an appointment, contact us online or give us a call at 954-755-1980 .